Melissa Chimera, "New Country," 2018. Oil, ink, silk, paper on canvas & linen. Hawai‘i Island-based artist Melissa Chimera engages present-day conversations around human migration by exploring her own genealogical history as a descendant of immigrants from the Philippines and Lebanon. Her most recent series draws upon archived material held in familial and public collections, including government-issued documents such as passports, to unpack terminologies used to describe the identities of those passing through borders. the canvas, layered with singed fabric—a reference to her Lebanese ancestors who worked in the textile industry after relocating to the United States. Chimera’s approach implies a nebulous sense of belonging that describes her personal reckoning as a member of multiple diaspora communities in resonance with larger social debates related to immigration. Chimera’s work is also informed by her academic and professional background in natural resource conservation. 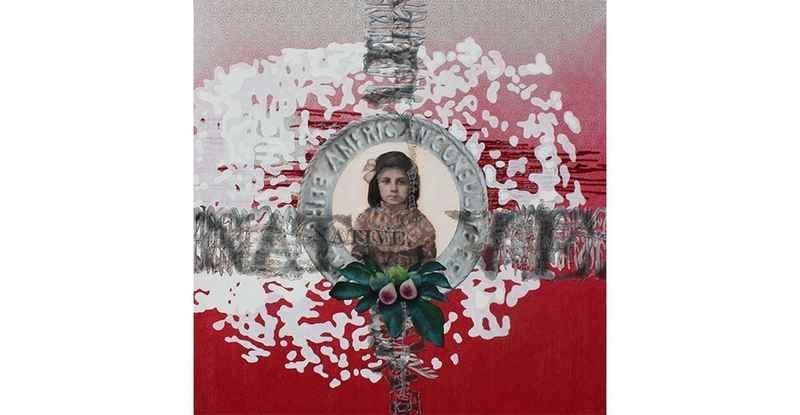 She frequently situates the individual within an ecosystem of political and environmental allusions, using endemic and introduced plants across the composition to consider ways in which self-perceptions are shaped by institutional structures and ecological conditions unique to each locale.